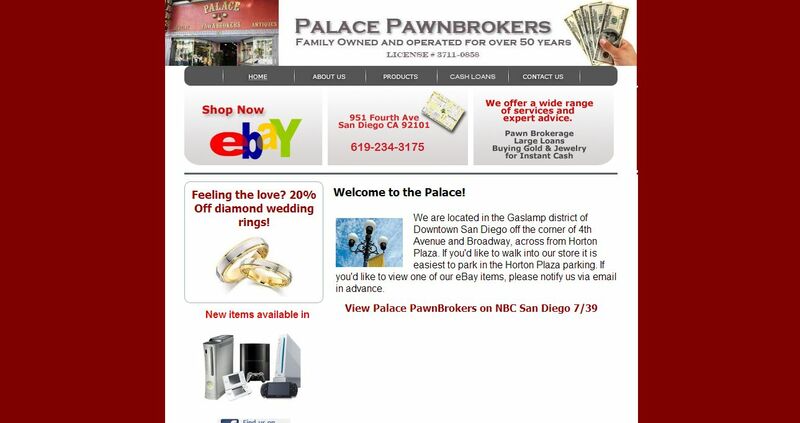 Palace PawnBrokers address, phone, website, and more. Palace Pawnbrokers was established in 1951 and has been family owned ever since. We have been located in the Gaslamp district, Downtown San Diego for over 50 years. The Palace has been providing San Diego with honest and reliable cash loans while taking pride in offering excellent customer service paired with quality merchandise at a discounted price. In today’s society, many people need to borrow small sums of money for a short period of time. Traditional lenders are unable to provide the small short-term loans. This is why Palace Pawnbrokers has been successful for so many years. We are able to offer small or large quick cash loans.